This is a photograph of our Lake Superior Agate rough. This material consists of agate nodules and pieces between 1/4" and 1" in diameter. Lots of red, white, gray, orange, brown and crystal color material with nice banding and occasional eyes. The rough in the photo above is wet to show full color. Lake Superior Agate is widely known as a tumbling rough. It is so popular in the Great Lakes area that the Minnesota legislature designated it as the official "state gemstone". Lake Superior Agate is typically a banded material - often concentric - but sometimes has eyes and mossy patterns. The red, yellow, orange and brown colors are a result of an iron pigment within the agate material. Our Lake Superior Agate mix consists of small nodules and nodule fragments found in the Great Lakes area. It is a tough, dense material in pieces that range from approximately 1/4" (6 mm) to 1" (25 mm) in size. It takes a great polish. We use TXP polish - an aluminum oxide compound - when we polish Lake Superior Agate. 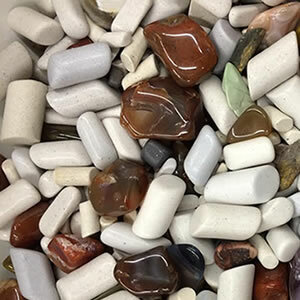 This peek into our media bucket shows a few pieces of Lake Superior Agate (and a few other tumbled stones) that will serve as media the next time we tumble. Using rough or tumbled stones that could be improved is like getting the use of fine media for free. Confession: Lake Superior Agate Makes Great Tumbling Media! Truth be told, we believe that Lake Superior Agate can serve as an excellent rock tumbling media. It has a nice rounded shape and is, in our opinion, harder than the tumbling media that we sell. It also costs about the same as good tumbling media. So, when we need filler, we toss a couple of pounds of agate nodules into the tumbler instead of large ceramic media. After the polishing step we recover some really nice polished agates from our media bucket. Any agates that are less than "excellent" are allowed to run through the cycle again and the deeper material removal improves some of them to "excellent." It's like getting free media and some beautifully polished agates as a bonus. We probably shouldn't tell this little secret because it will probably trigger a demand for more Lake Superior Agate than we can obtain! A photo of some finished Lake Superior Agate that we polished is shown below. 1) More Time: Yes this is an agate and it is sized nicely for tumbling, however it will require more time in coarse grit than the EASY tumbling roughs. Why? It is extremely hard. It does not seem to wear down as fast as other agates in a rock tumbler. We usually run it up to four weeks in coarse grit before moving on to medium grit. We usually tumble it for four weeks straight, but you might want to tumble for two weeks, clean it up, then decide if you want to run it for one or two additional weeks in coarse grit. When you are happy with the smoothness, move on to medium grit. Coarse Grit Step: Fill your tumbler barrel about 2/3 full of Lake Superior agate rough. Then add 2 tablespoons of coarse (60/90) grit per pound of material in the barrel. Add enough water to cover the tops of the agate. Run the material in coarse grit for at least 2 weeks. After two weeks check your material. If you are happy with the shaping and smoothness move onto the medium grit. If more shaping is desired, clean the rough and start tumbling again with a clean barrel and fresh grit. If you are lazy, like we are, simply run this material for one month straight without a two week check and clean up. If you plan on running for four weeks straight you should add about 20% more grit and a little extra water. At the end of all steps in the rock tumbling process, make sure to thoroughly clean your rocks and barrel to reduce the chance of coarser grit contaminating the finer grit steps. This cleaning is especially important before you begin the polishing step. Medium Grit Step: Put your cleaned rough back into the barrel. If the barrel isn't at 2/3 full, add a little media to bring it up to operating capacity. Then add 2 tablespoons of medium (150/220) grit per pound of material in the barrel. Add water until it is just below the top of the rocks. Tumble for one week.